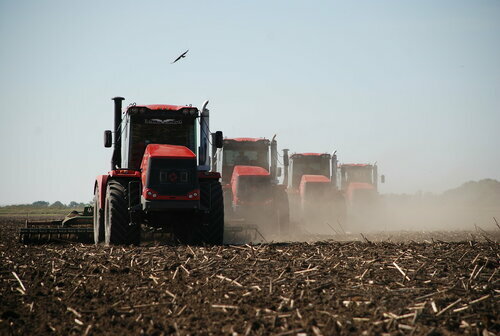 5-th generation of tractors «Kirovets». 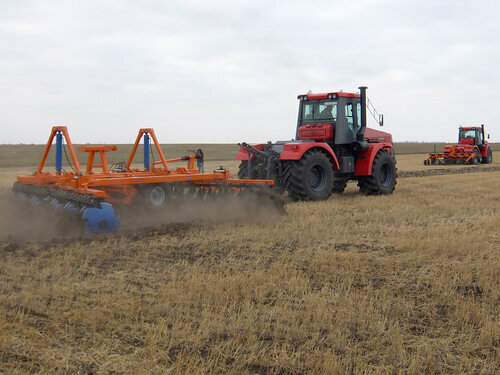 The basic concept of the «Kirovets» tractors is high performance, excellent off-road performance and maneuverability, simple and reliable design, reparability, building block design with the traditional, as well as modern wide-cut complex tillage and seeding machinery. 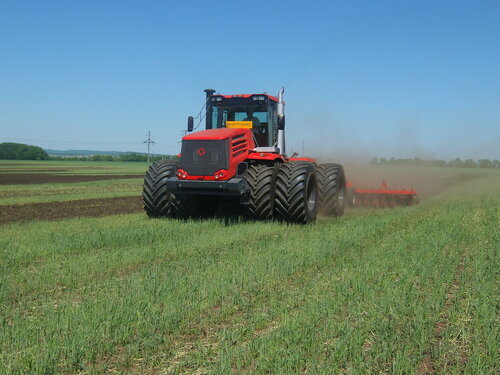 Capabilities of one tractor K-744Р series allow to cultivate and to sow up to 5 000 ha with full compliance of agronomical terms within the year. 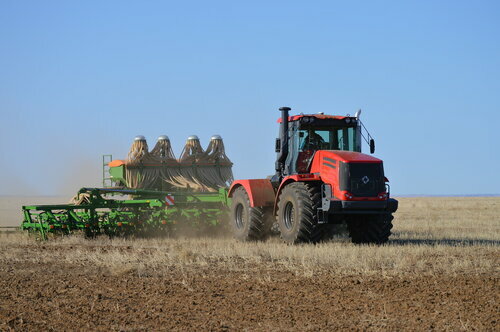 At the same time, a minimal cost of 1 ha sowing is guaranteed. 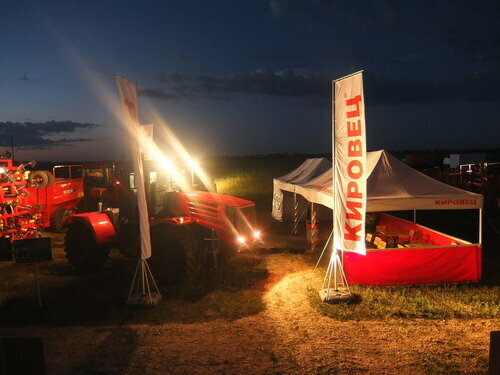 Due to its excellent towing and transport characteristics, the «Kirovets» tractors are used year-round in the toughest hauling operations: cold weather operation, towing of jammed vehicles etc. 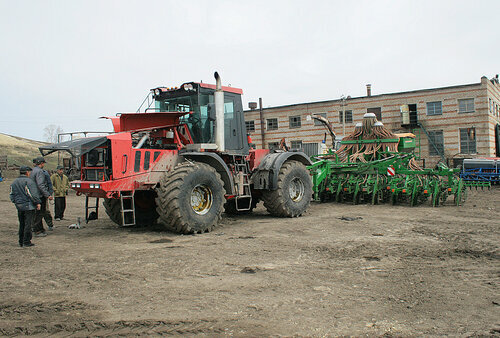 Warranty period for the «Kirovets» tractors K-744Р series is 1 year or 2000 running hours. 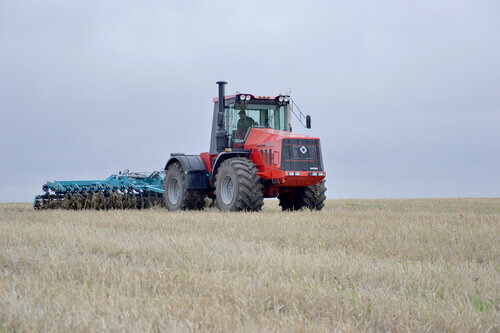 There are 4 models of agricultural tractors for common use of 5…8 drawbar categories with 300 – 428 hp represented in the K-744Р series. Each model can be equipped with an engine of domestic or foreign manufacture. 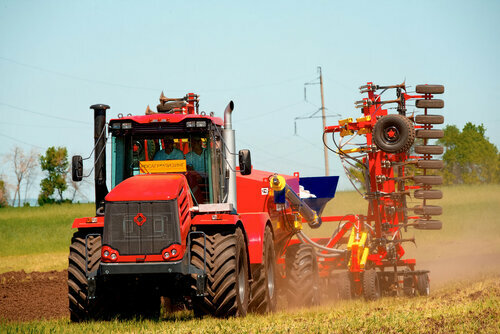 All tractors are equipped with implement hydraulic system with axial piston pump and peak performance of 180 l/min. 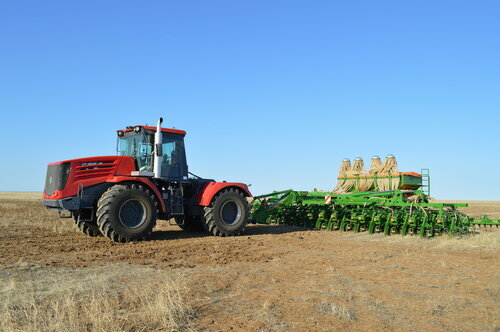 The basic configuration of all tractors includes three-point hitch of the ISO system IV N category with quick connectors, draft and hydraulic hook. 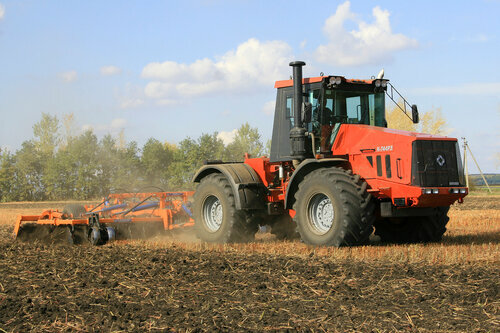 Optionally the tractor can be equipped with optional equipment expanding its process capability. 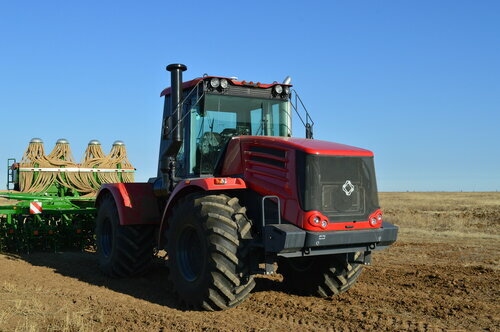 K-744R4 «Premium», Mercedes, 428 hp. 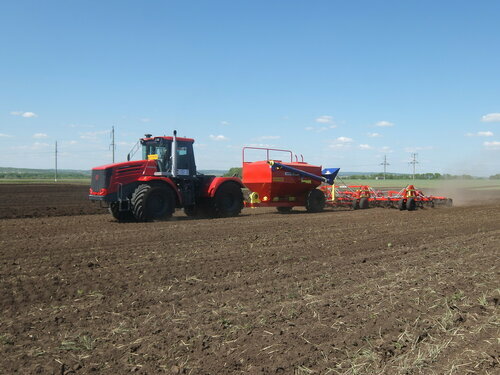 K-744R4 «Standard», Tutaevsky MZ, 420 hp. 400 K-744R3 «Premium», Mercedes, 401 hp. 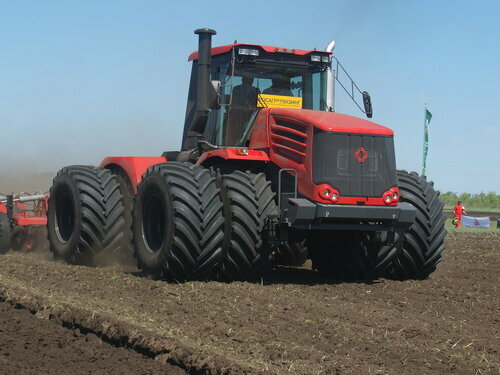 K-744R3 «Standard», Tutaevsky MZ, 390 hp. 350 К-744R2 «Premium», Mercedes, 354 h.p. К-744R2 «Standart», Tutaevsky MZ, 350 h.p. 300 К-744R1 «Standart», Yaroslavsky MZ, 300 h.p. Reinforced transmission housing, with 5th support bracket. 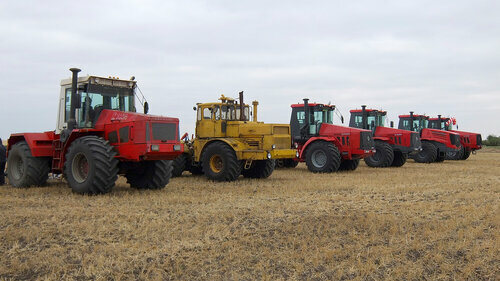 Forth generation of Kirovets tractors, series К-744 (220-350 h. p., only for export) – the year 1995. 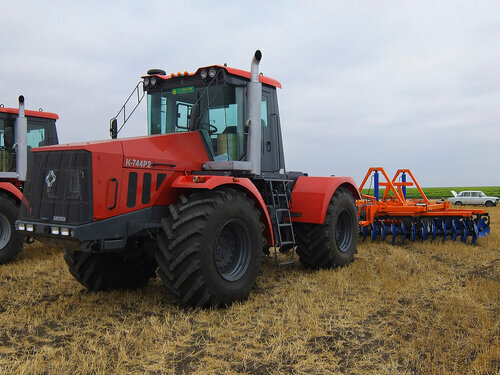 Fifth generation of Kirovets tractors, series К-744Р (250 – 428 h .p.) – the year 2000. The history of К-744Р series began in the 1990s. 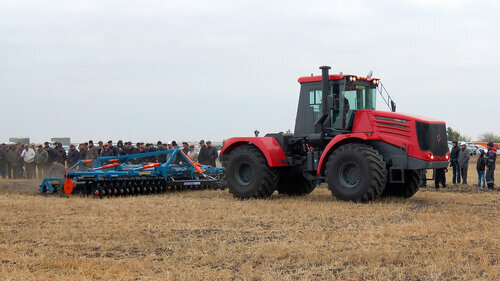 High interest in Kirov factory’s products was demonstrated in Germany. 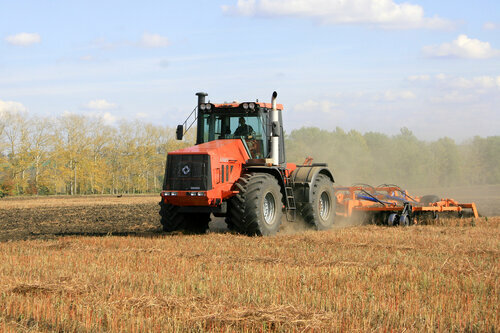 In Europe Kirovets tractors established a reputation as reliable machines, at the same time being very budget-friendly in comparison with the competitors. 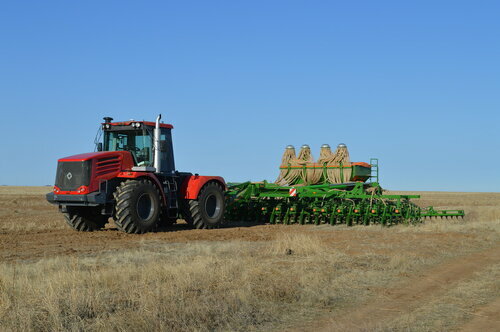 In foreign countries large tractors are traditionally used specifically for works where they are most effective and can reach their potential. 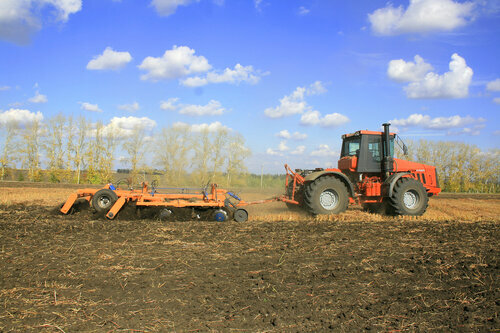 Kirovets tractors were frequently used for spring field works after which they were laid up till the next season. 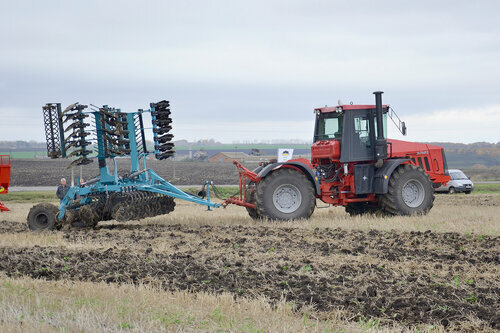 As a result, machines are still preserved in Europe which have been in operation for up to 30-40 years. 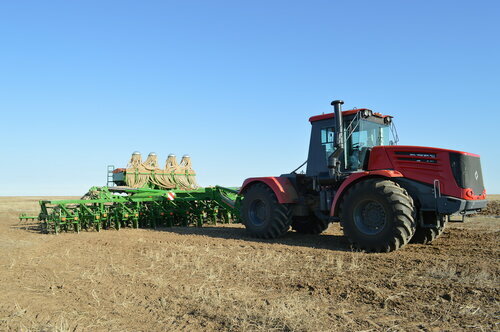 However, by the middle 1990s tractors К-700А and К-701 have become completely obsolete – first of all, it was the cabin which did not meet stringent requirements for safety and operator’s working conditions. Therefore, the tractor was, so to say, designed anew for supplies abroad. 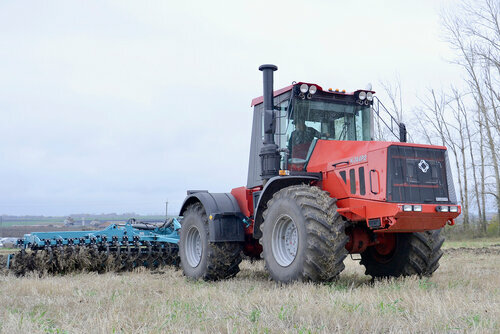 Model К-701 М that was a self-design project of Kirov factory’s engineers in 1980s was taken as a basis– the tractor was in many ways state-of-the-art at that period. 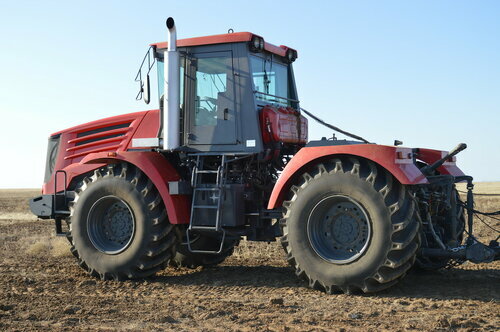 Reinforced frame, new transmission, high-power motor, easy steering – this is by far not a complete list of features that distinguished this tractor from its predecessors. Our design engineers together with German experts developed a completely new cabin with a safety cell, replaced and upgraded many components and assemblies. On some machines high power foreign motors and hydraulic components were mounted. 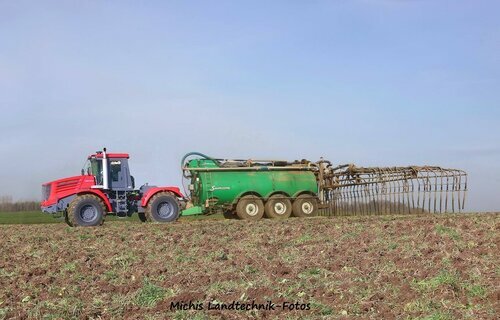 From 1995 these machines are in constant demand in Germany. 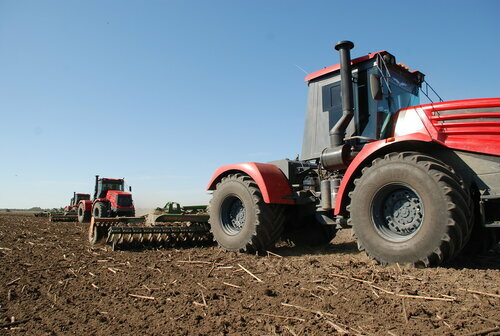 At the beginning of collaboration with Germans a decision was taken to discard obsolete models eventually – and produce modern tractors for Russia as well. 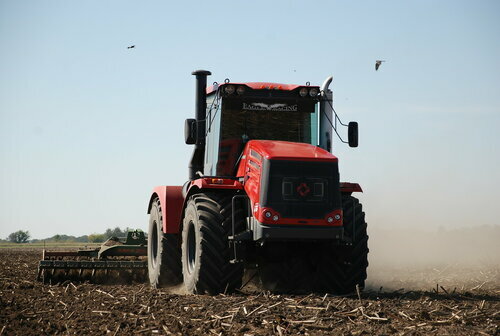 The experienced accumulated in the process of tractor development for Germany was used in launching 744 series in production in 2000. 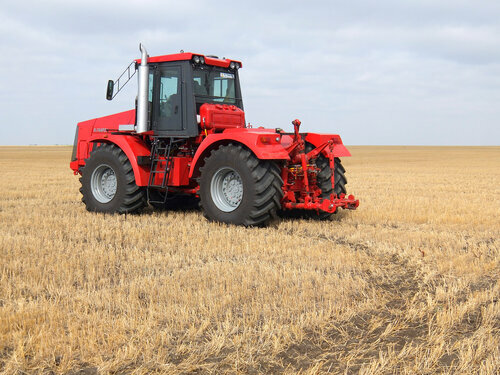 Factory experts continuously monitored performance of our machines in foreign countries, investigated challenges and issues occurred, and considered what should be modified, reinforced and upgraded in the tractor design. 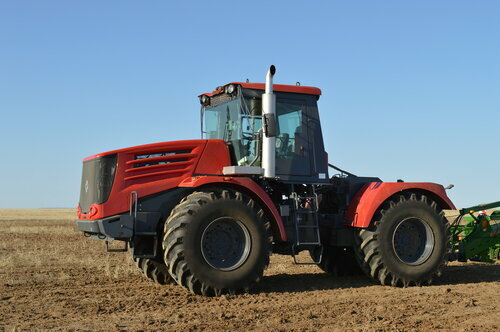 As a result, the tractor of К-744Р series of 2000 design had little in common with its predecessors. 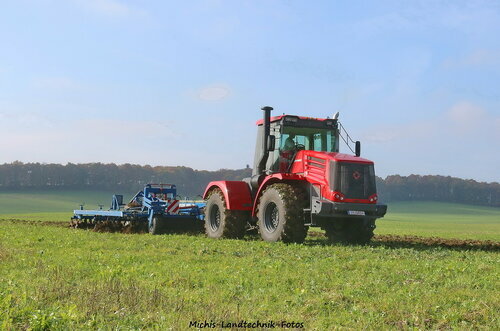 But the refinement process did not top at that – having begun in the mid 1990s as deep improvement of an old model it resulted in emerging of absolutely new tractors that meet modern requirements. 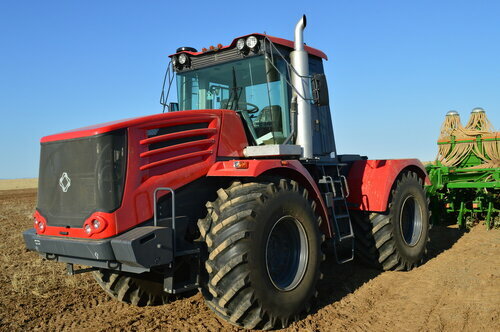 How did outside appearance of К-744Р tractor change?! 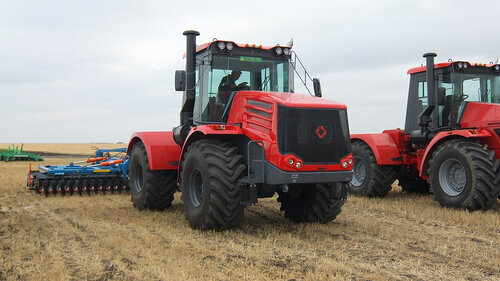 From 2000 tractors of К-744Р series have undergone several phases of remodeling and restyling. One of the most significant and large-scaled phases took place in 2014. 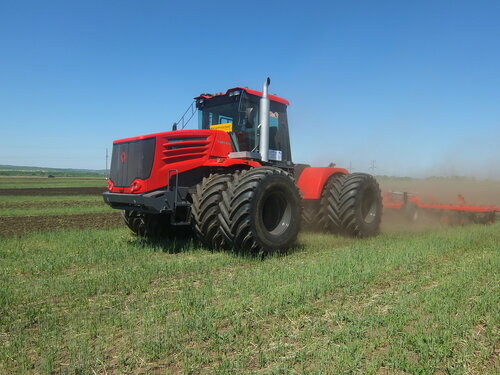 In order to improve consumer properties of Kirovets tractors the factory carried out a large-scaled comprehensive upgrading of the entire range in 2014. Deep upgrading made it possible to maintain highest performance indicators, as well as to add a whole spectrum of new functions. Powerful hydraulic pump with capacity of 180 l/min and modern hydraulic directional valve with 5 adjustable sections provide combining with all modern implements. 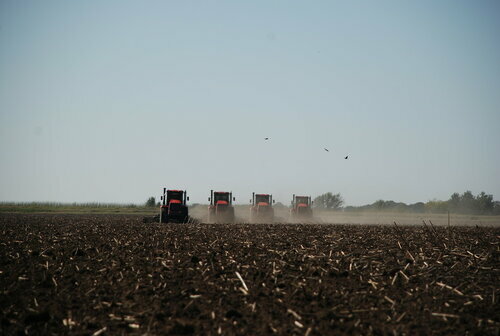 A proven reliable transmission with gear shifting without stopping. 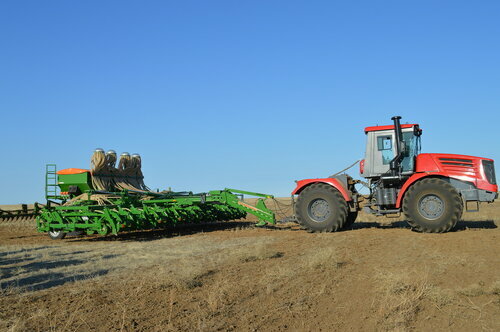 Heavy versatile rear three-point hitch. Capacious fuel tank, which allows working during the season without loss of time for refueling. 7. Wheels doubling system providing the low ground pressure and increased traction on the field. 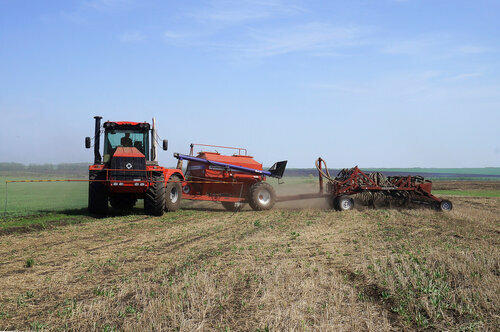 Less details of hydraulic system, less hydraulic connections, the new all-season oil – the higher reliability and ability to work at very low temperatures down to -40 °С. The air cleaners of new design with cyclone – easier to maintenance, more reliable operation of the engine. Radiators for the K-744 Р3 and K-744 Р4 models with enhanced water section and oil section tilting system – easier to maintenance, more reliable operation of the engine. 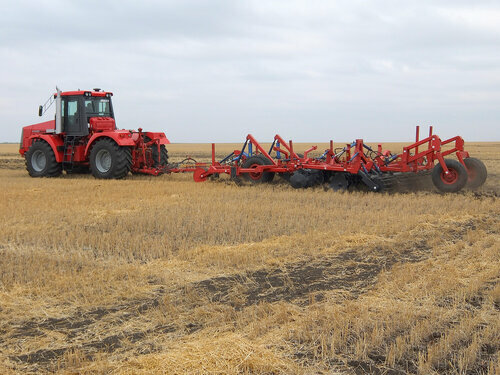 The unique agricultural hitch of new and more versatile design – one hitch fits both domestic and foreign implements just as of 3-d, so of 4-th category. 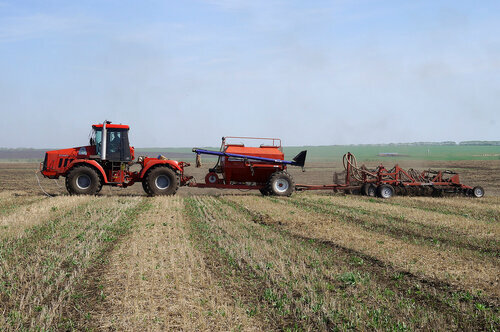 The new EHR option – agricultural implements’ electrohydraulic positioning system provides a full-fledged operation with the reversible plows and other mounted and semi-mounted implements without adjusting carrying wheels. 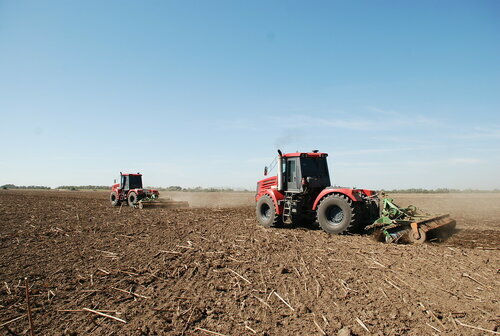 In the basic tractors’ configuration the preparations for the GLONASS monitoring systems installation are carried out for providing the collection and storage of more than 15 parameters of the tractor operating conditions. 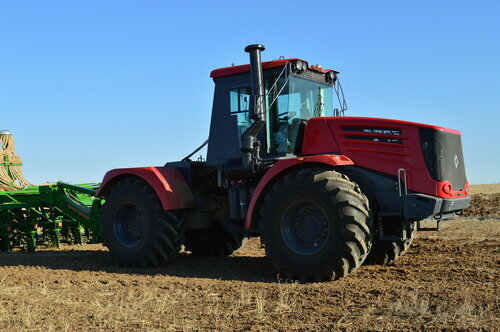 The outer lining of the tractor has been changed, that highlights the tractor modernization, keeps the brightness and color saturation for the entire period of operation, and is not exposed to corrosion. Comfortable cab – improved noise and vibration insulation, air conditioning, heater, sun protection. 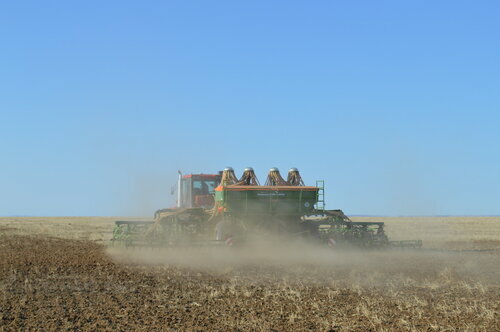 We have done everything for you to provide excellent seeding-down in the most optimal short terms and with minimal costs. 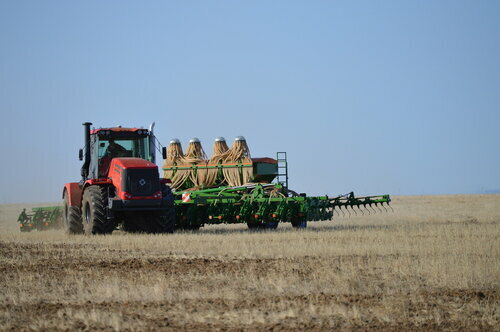 Excellent seeding - profit in the future. 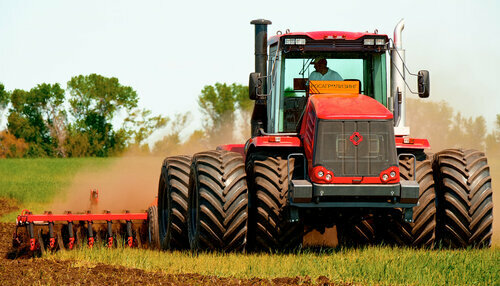 The refined style and unique formula of the «Kirovets» tractor will give an unequaled ease of your everyday work. 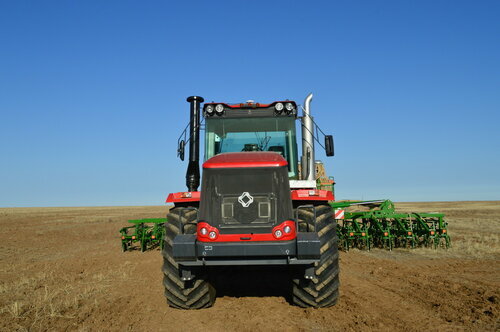 Engines with power from 300 to 428 hp Domestic – Yaroslavsky and Tutayevsky plants, foreign – Daimler AG and Cummins Inc.
Tractor operating weight is 15 – 19 tons. 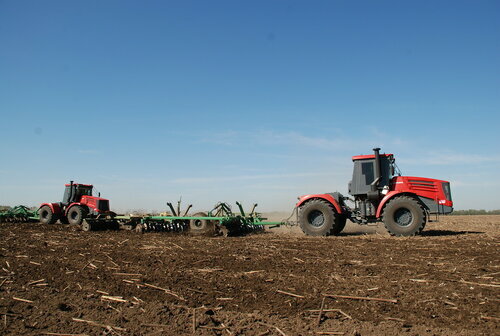 To improve the coupling properties the wheels doubling and the tire pressure reducing when working on soft floor are possible. Axial-plunger pump of 180 l/min. *Powerschift – some manufacturers use this or similar name as a trademark to mark their products (transmission) or engineering solutions. In the context of this document, it is implicated that the powerschift transmission principle is used in the «Kirovets» tractors gearbox. The favorable and safe working conditions. Ergonomics, centrally located driver's seat, excellent overview, comfortable microclimate due to the air conditioner and powerful heater, and reliable safety cage. High power. Powerful and low-consumption 6- and 8-cylinder turbodiesels, power up to 428 hp, drive torque up to 2000 Nm, torque backup up to 36%. Cold weather starting system. Streamlined cooling system. Engine manufacturers – YMP, TMP, Mercedes-Benz, Cummins. 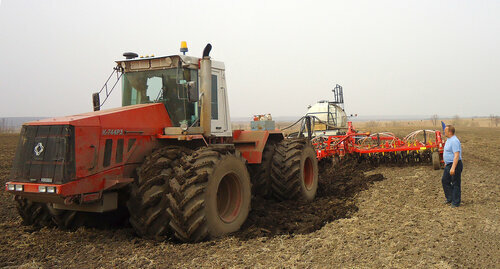 Traction without power loss. Hydraulically-operated mechanical gearbox: 4 bands, 16 gearings for moving forward and 8 gearings for moving backward. 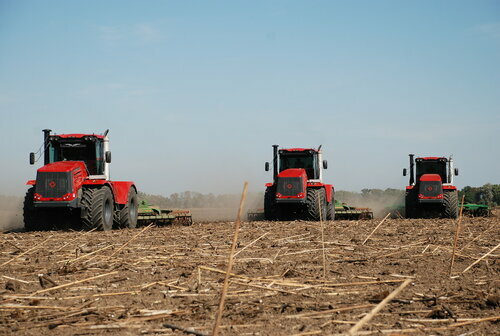 Gearshift in each band under the workload is without power loss. Expandable traction. Wheel doubling set and additional ballast weights to enhance the traction abilities. Excellent road performance. Efficient all-wheel drive, leading axles self-locking differential, planetary hub reduction, contour following, sprung front axle, excellent maneuverability. No time lost operation. Capacious fuel tank for 12-14 hours work without refueling. Articulated frame providing good maneuverability by virtue of a small turn radius. Assemblies and units effective configuration for easy control and maintenance. Combining with any planker. 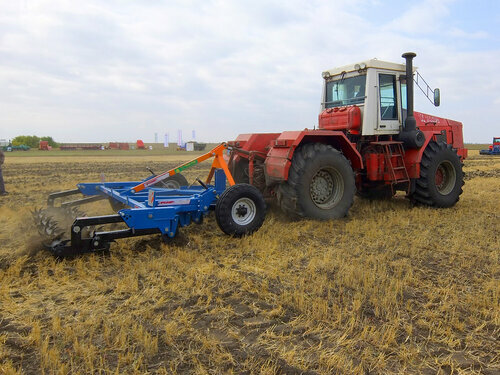 Modern implement hydraulic system, IV category three-point hitch in basic configuration, floating drawbar, draft and power takeoff mechanism. High economical effectiveness. Reasonable purchase price. 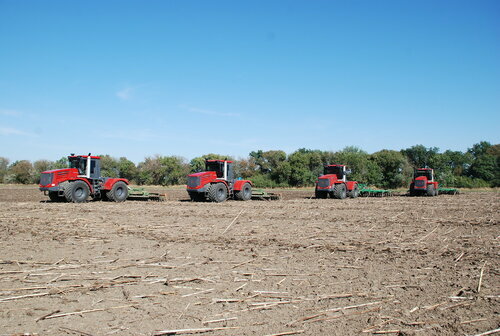 There are about 40 000 Kirovets tractors in the state fleet. Spare parts mature market. High capacity. Low operating cost. direct relation with manufacturing facility. Low ownership cost due to use of common and non-expensive POL, spare parts and consumables for operation and technical maintenance. Familiar design and excellent repairability which makes it possible, if necessary, to maintain the equipment in working order without involving highly-qualified specialists and specialized equipment. Affordability of spare parts, availability of repair facilities with trained personnel, large amount of technical literature. 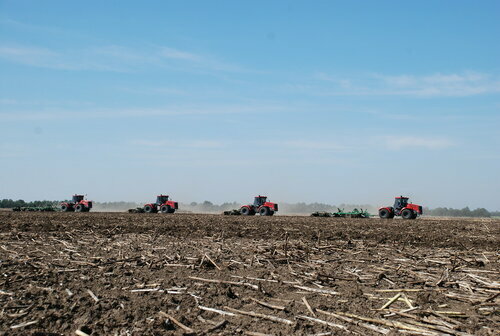 Enormous fleet of Kirovets tractors. Agricultural business like any other business sets a goal for all-level management to receive required amount and level of profit. A high-priority task in this is to ensure production of finished products of defined prime cost and in required quantity. These universal business tasks are handled in each specific case by applying a unique and optimally selected by managers combination of technologies and techniques supporting these technologies. In our case these are agricultural technologies and techniques. 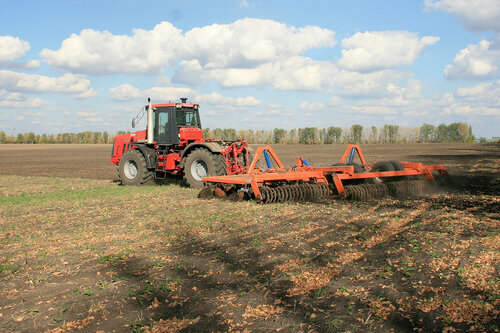 Kirovets is a traditional tractor in Russia. 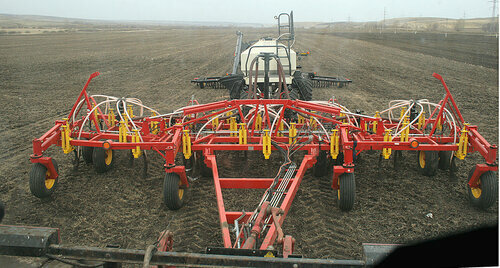 There is a vast experience of its use accumulated, varieties of attachments that can be used on Kirovets are known. Today we speak about expanding the opportunities. 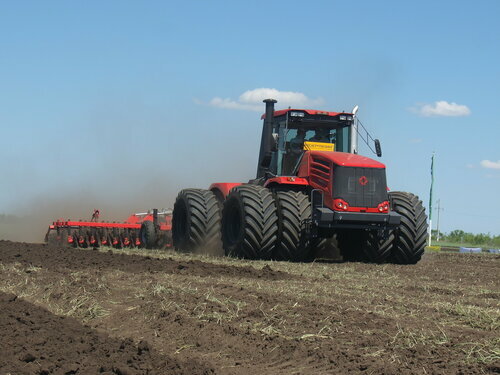 By means of increasing tractor power we can work at high speeds, apply more efficient wide-cut implements, use combined assemblies. 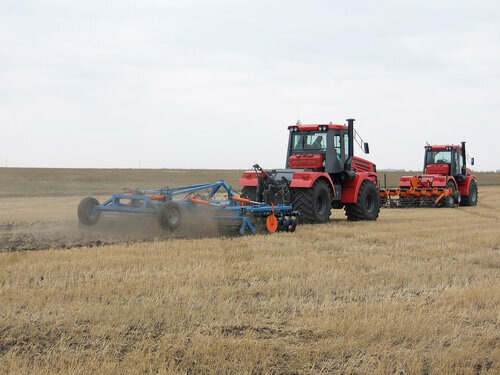 An attachment mounted on all tractors of basic configuration makes it possible to work with plows and other implements for which a three-point or four-point assembling system is required. 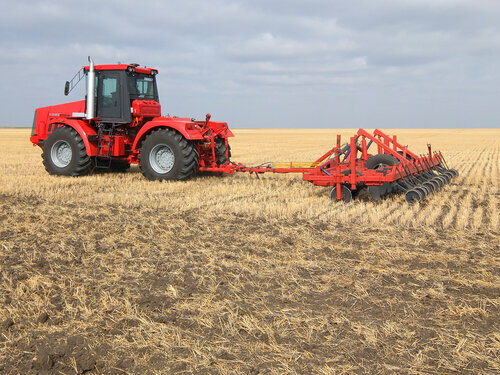 Powerful hydraulic system with working equipment axial piston pump and flow control on the distributor section provides the opportunity to work with tractors sowing complexes. 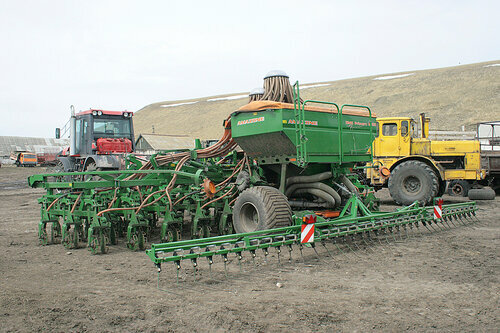 Because of this «Kirovets» K-744R successfully fit into any modern agricultural technologies. При посевных работах необходимо обеспечить наилучшие условия для ранних всходов и роста культуrub. Чтобы заложить прочную основу для получения больших объемов урожая, необходимо уделить должное внимание качеству посева. Современные сельхозмашины, оборудованные навесными сеялками, позволяют достичь этих целей с минимальными эксплуатационными затратами. Таким образом, их использование повышает эффективность работ и позволяет снизить себестоимость готовой продукции. В настоящее время все большую популярность получают передовые технологии посева, при которых выполняется большое количество операций за один проход. В связи с этим получают все большее распространение посевные комплексы, позволяющие производить посев одновременно с несколькими операциями по обработке почвы и внесением удобрений. Наиболее широко на рынке посевных комплексов представлены следующие иностранные производители – Amazone, Bourgault, Horsch, Kverneland, Агро-Союз, Vaderstad, Salford, Rabe. В России также производят подобную технику. Наиболее известны посевные комплексы «Томь» и «Кузбасс» производства ООО «Агро» (г. Кемерово), линейка «Агромастер», включающая агрегаты с шириной захвата от 6,6 до 12,2 метров (Республика Татарстан), машины почвообрабатывающие посевные «Чародейка» (Свердловская область). Не менее популярны среди сельхозпроизводителей и механические сеялки, как традиционной конструкции, так и более современные, позволяющие сеять с одновременным внесением удобрений и осуществлять прямой посев. Для тракторов нашего тягового класса подходят в основном модульные конструкции, объединяющие в себе несколько механических сеялок небольшой ширины. Преимущества такой конструкции очевидны – небольшая цена, отдельный модуль в случае его неисправности всегда можно оперативно заменить на другой и продолжить работу, можно использовать модули отдельно с тракторами меньшей мощности, если возникает такая технологическая потребность. К недостаткам таких сеялок можно отнести необходимость частой загрузки сеялок из-за небольшого объема бункеров, а также большая требовательность к подготовке почвы. Посев может производиться как в почву, подготовленную по традиционной технологии, так и с минимальной подготовкой или без подготовки почвы вообще (технология No-till – посев в стерню). Для широкозахватных сеялок и посевных комплексов требуются тракторы высокой мощности. Наибольшие требования к гидросистеме рабочего оборудования (ГРО) трактора предъявляют пневматические посевные комплексы. Для успешного агрегатирования с пневматическими посевными комплексами тракторы «Кировец» уже в базовой комплектации оснащенны ГРО с LS-регулированием (LS или Load Sensing system – система чувствительная к нагрузке). Она включает в себя аксиально-поршневой насос, гидрораспределитель с регулируемыми секциями, линии свободного слива и дренажа. Кировский завод предлагает ГРО с LS-регулированием максимальной производительностью 180 л/мин. Так как шестеренные насосы без дополнительных "манипуляций" не обеспечивают надлежащую работу с пневматическими комплексами, ряд отечественных и зарубежных производителей пневматических сеялок предлагают специальное комплекты дооборудования как для трактора, так и сеялки: ДВС соединенный с вентилятором сеялки, аксиально-поршневой насос соединенный через ВОМ трактора. Каждый из этих вариантов имеет массу недостатков. Поэтому мы на всех наших тракторах сейчас в базвоой комплектации предлагаем аксиально-поршневые насосы. Механические сеялки имеют ряд преимуществ как с точки зрения агротехнологий, так и по причине более низкой цены и простоты эксплуатации. В частности зерно падает в землю под своим собственным весом, а не бьется о стенки семяпровода, увлекаемое воздушным потоком. Имея меньший объем бункеров, такие сеялки оказывают меньше давления на почву и т.п. Также механические сеялки не требовательны к гидравлике. Ориентировочные значения потребности в мощности трактора приведены в таблице ниже. В связи с разнообразием компоновочных схем, объема бункеров, потребностей в мощности на привод рабочих органов и других конструктивных решений, а также предполагаемых условий эксплуатации при подборе конкретного комплекса нужно ориентироваться на рекомендации его производителя. Требуемая мощность трактора на метр ширины захвата, h.p. Сегодня на рынке представлено большое количество сельскохозяйственных орудий для поверхностной (предпосевной) обработки почвы. В основном в них присутствуют такие рабочие органы как лапы (сошники) разных типов, диски, секции зубовых борон, катки прикатывающие и разбивающие комки. Комбинации рабочих органов многочисленны, каждый производитель стремится сделать оригинальную конструкцию и обосновать ее преимущества. Различны и наименования агрегатов – культиваторы, культиваторы дисковые, лущильники, дисковаторы, компактоматы, агрегаты комбинированные и дrub. Для упрощения будем далее подразумевать под культиваторами любые орудия для поверхностной обработки почвы. Основное назначение культиваторов – уничтожение сорняков, поверхностное рыхление, мульчирование почвы, выравнивание микрорельефа почвы, регулируемое уплотнение верхнего слоя почвы. Они применяются как в системе обработки почвы по традиционной технологии – для выравнивания зяби, предпосевной культивации, уходу за парами, так и в системе минимальной обработки почвы – для предпосевной культивации, для выравнивания микрорельефа поля, для ухода за парами. Нередко производители посевных комплексов предлагают использовать культиваторную часть без бункера – для обработки почвы. В частности посевной комплекс серии 580 компании Salford включает в себя полевой культиватор, который можно использовать не только для посева, но и для обработки почвы. Если потребности в посевном комплексе нет, культиватор можно приобрести отдельно. Бороны дисковые предназначены для рыхления и подготовки почвы под посев, уничтожения сорняков и измельчения пожнивных остатков, для предпосевной обработки почвы без предварительной вспашки и обработки почвы после уборки толстостебельных пропашных культуrub. Конструктивно дисковые бороны могут иметь массу исполнений. В основном на рынке представлены двух- или четырехрядные дисковые бороны. Двухрядные бороны могут быть Х-образными. Диски могут располагаться батареями – на одной общей оси или каждый на своей индивидуальной оси. Изменяемый угол атаки дисков позволяет регулировать качество обработки почвы в зависимости от агротехнологических требований. Для поднятия залежных земель вся серия тракторов КИРОВЕЦ может быть доукомплектована специальной защитой. В России велика доля традиционных технологий основной обработки почвы с оборотом пласта, поэтому рынок плугов достаAccurately велик. Тракторы «Кировец» эффективно работают как с загонными, так и с оборотными плугами. Основную обработку почвы на глубину более 16 см проводят отвально-лемешными плугами. В засушливых районах, подверженных ветровой эрозии, используют культиваторы-плоскорезы-глубокорыхлители и чизельные плуги. По конструкции корпусов различают плуги лемешные, дисковые, комбинированные и чизельные. Наиболее распространены лемешные плуги. Их применяют для вспашки почвы с оборотом пласта. Подразделяются на плуги общего назначения (для вспашки старопахотных земель) и специальные (для каменистых почв, кустарниково-болотные, плантажные, садовые, ярусные и дrub.). Дисковые используют для вспашки тяжелых, пересохших и переувлажненных почв на поливных и других землях. Комбинированные применяют для вспашки тяжелых почв с одновременным интенсивным рыхлением почвенного пласта. Чизельные плуги лишь условно относятся к плугам, так как в их работе отсутствует оборот пласта, по сути, это глубокорыхлители. Отвальные корпуса по форме рабочей поверхности подразделяются на культурные, полувинтовые и винтовые. Культурные хорошо оборачивают и крошат почвенный пласт, поэтому их используют для вспашки старопахотных почв; полувинтовые и винтовые хорошо оборачивают пласт, но плохо крошат его - с их помощью вспахивают сильнозадернелые, целинные и залежные земли. Агрегатирование производится через навесное устройство трактора. Для прицепных плугов с одной точкой агрегатирования (на нашем рынке практически не присутствуют) требуется установить на трактор маятниковое сцепное устройство (опция). Требуемая мощность трактора на один корпус плуга, h.p. Глубокорыхлитель (чизель, щелеватель) используют для глубокого рыхления уплотненного непромокаемого слоя почвы, с целью разуплотнения плужной подошвы без оборота пласта. Глубокорыхлитель просто незаменим для обработки заплывших почв, залежных земель и кормовых угодий. По сравнению с плугом глубокорыхлитель считается более прогрессивным орудием, которое позволяет добиться улучшения водно-воздушного режима корневого слоя почвы, предотвращения развития эрозии почвы, накопления влаги и повышения урожайности сельскохозяйственных культуrub. Глубокорыхлители (чизельные плуги) применяют для рыхления почвы по отвальным и безотвальным фонам с углублением пахотного горизонта, безотвальной обработки почвы взамен зяблевой и весенней пахоты, глубокого рыхления на склонах и паровых полях. Глубокорыхлители разрушают плужную подошву, возникающую при традиционной обработке почвы и разуплотняют почву при минимальной или нулевой технологиях. Обработка почвы на глубину до 50-60 см может производиться как по вспаханному полю, так и по стерне зерновых культур или после уборки пропашных культуrub. Периодическое чизелевание разуплотняет почву, восстанавливает фильтрацию и обеспечивает свободный доступ кислорода на обрабатываемую глубину. Все большее распространение получают комбинированные агрегаты с чизельными лапами, позволяющие за один проход полностью подготовить почву к посеву, а также с минимальными затратами возвращает залежные и брошенные земли в сельхозоборот. Работа в сельском хозяйстве предъявляет к технике повышенные требования по проходимости и тяге. Дорожные условия хозяйств очень часто контрастируют даже на небольшом участке. Требуется техника способная круглый год работать в смешанных дорожных условиях: весенняя распутица, непролазные грязные колеи, мороз, сугробы и т.п. Трактор "Кировец" самое универсальное для этих условий транспортное средство. Он создан не только идти по дороге, но и прокладывать новую. Тракторы "Кировец" круглогодично успешно применяются на самых тяжелых транспортных работах: эксплуатация в холодную погоду, буксировка застрявшей техники и т.п. 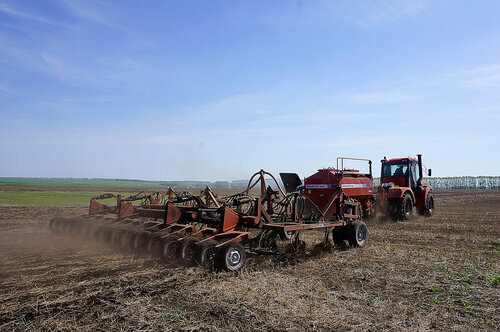 The example of investments return analysis of the machine-tractor complex in No-till agro-technology. Initial data. 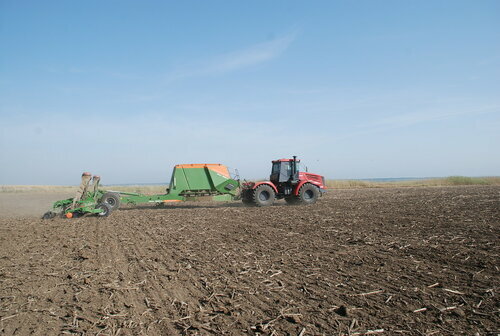 Agriholding, specialized on the chicken production and selling, purchased 10 000 ha land plot for the construction of new poultry farm. 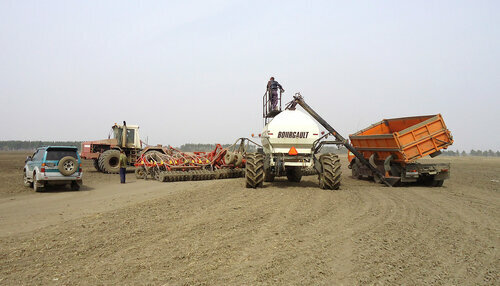 This land plot will be used for the feeding base forming. 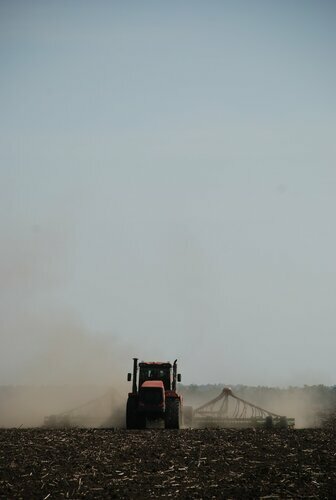 The wheat will be grown. 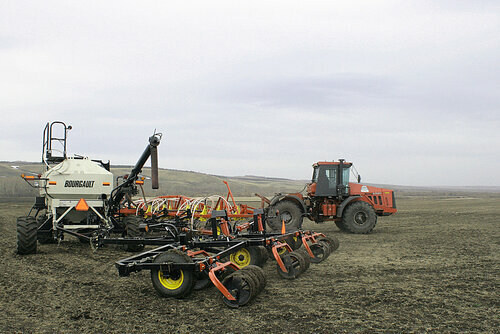 With this due to climate conditions only spring wheat can be grown. 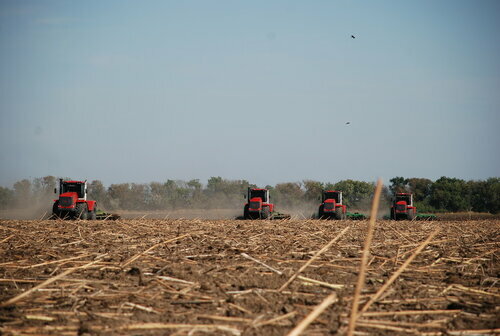 Precipitation level is quite low, so moldboard plowing is completely denied. 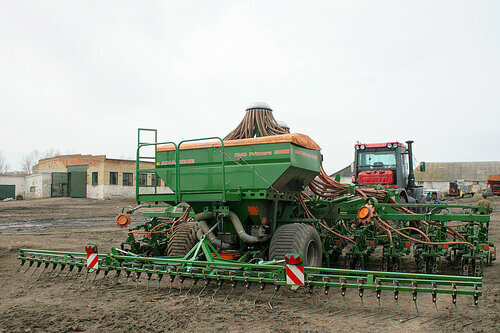 Pneumatic sowing machine with the sowing width of 12 meters + tractor «Kirovets» К-744Р4 (420 h.p.) 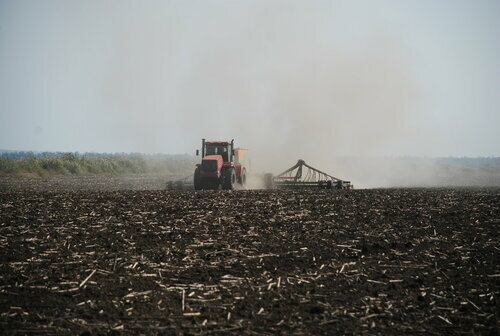 Sowing machines’ operational speed is 10 km/h. 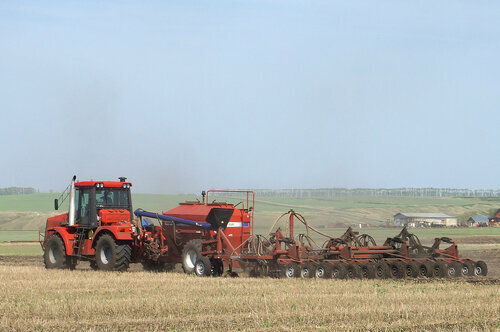 Sowing machines’ operational speed is 10 km/h. 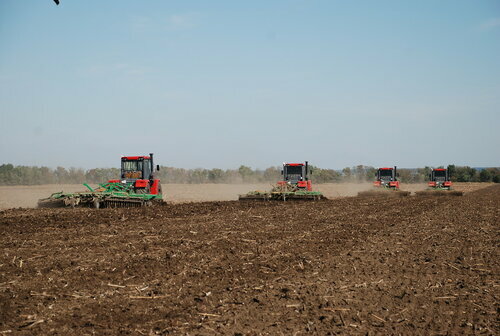 Consequently, hourly efficiency of tractor machines is relatively (sowing width /10 х operational speed in km/h.) 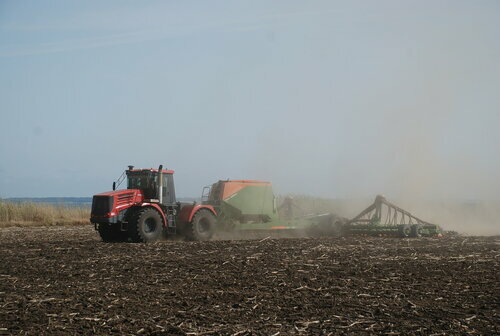 8 and 12 ha/h. 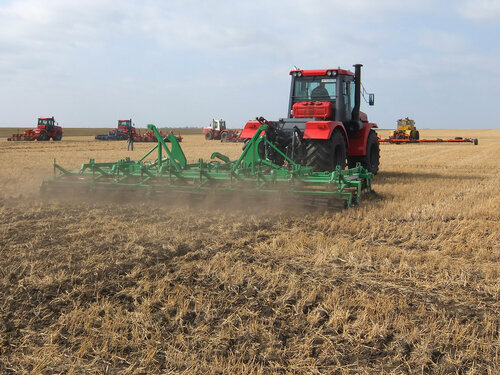 Number of tractor machines required Accurately = 4,2, round to even = "5" Accurately = 2,8, round to even = "3"
Average market cost of wheat 8 500 rub/ton. Expected savings rate 8 500 rub/t. х 25 000 t. х 15% = 31,9 mln. rub. 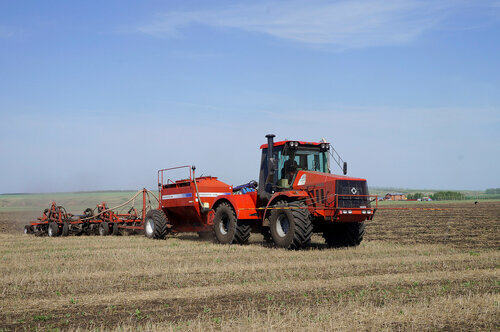 This investment analysis actually shows that more efficient tractor machine provides investment return 1,5 times faster. A great experience of the use of foreign machines has been accumulated in Russia, the calculation can be based on adequate data. 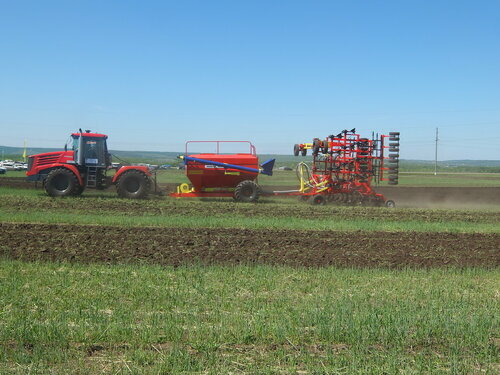 TOTAl: the practically tested economic effect from using Kirovets tractor instead of foreign manufacture tractors of similar power amounts to at least 9.1 mln. rubles. Unified, with «no-spin» self-locking differential and mutually spaced planetary hubs. The front axle is suspended from the frame on two longitudinal semi-elliptic springs with hydraulic buffers. The rear axle is rigidly connected to the frame. Double, with built-in safety cage, with thermal-, vibro- and noise-insulation, with air conditioning and heating systems. Modular, cooling agent R134a (halocarbon) is used. Load sensitive (LS) system: adjusted axial-plunger pump, 5- sectional hydraulic directional valve, 4 pairs of blank terminals (hydraulic lines) with adjustable consumption, free dumping and drainage lines. Maximum pump capacity 180 l/min. 1000 rpm (single-speed), stand alone, with a circulating gear lubricating system. Three shaft end design versions. IV category ISO standard three-point hitch, can be completed with III category adapters (option). 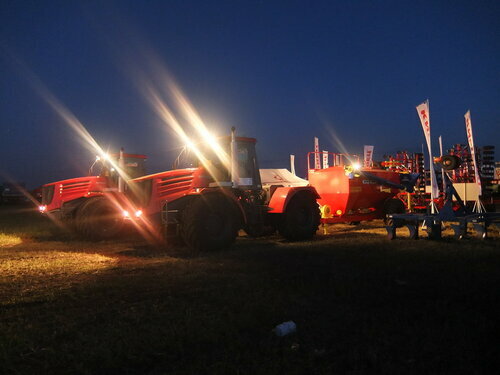 Specified workload (on the 610 mm distance from the hitch axes) is 5500 kg, on the hitch axes one is up to 8500 kg. Draft and tow bar (hydraulic hook) can be installed. Appropriate tongue load up to 2200 kg. 4 fellow spacing bushes DW24-26 and axle carrier stud screw М22. 4 fellow spacing bushes DW27Ах32 and axle carrier stud screw М22. The information on goods is for reference only and is not a public offer as defined by Article 437 of the Civil Code of the Russian Federation. The Manufacturer reserves the right to change completeness and technical features of goods without prior notice. 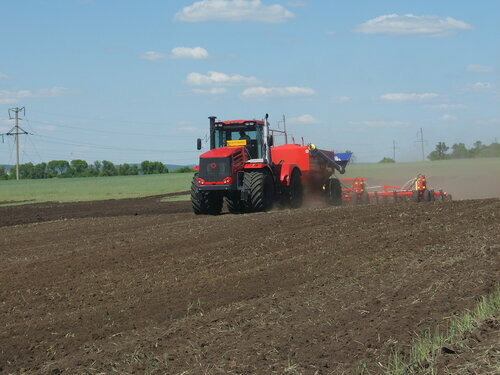 To obtain detailed information on the scope of supply and cost of Kirovets machinery, please address to the Company’s sales department and its official dealers. All photos placed below can be downloaded in the «big» resolution format. To do this, click on the photo, you will proceed to the storage media, where you can download the photos in original quality. 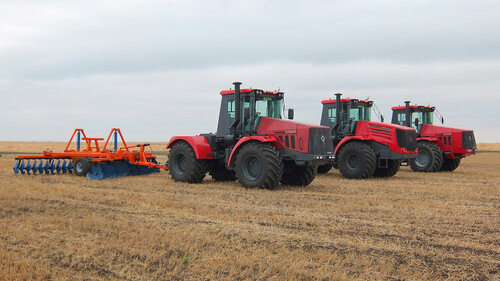 Great videobank with operating Kirovets agricultural tractors is available here.